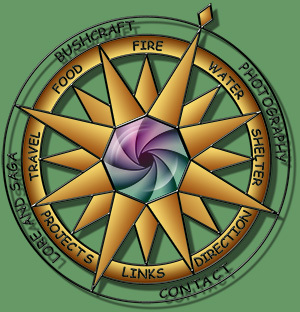 What is Bushcraft all about? Roughly one and a half million years ago our ancestors started to use fire to warm themselves, provide light and cook their food. Since then human beings have in turns been hunter gatherers, agriculturalists, industrialists and now perhaps we would be best described as technologists. In the last couple of centuries humanity has largely participated in an unstoppable race to exploit every available fuel source to feed our modern civilisation’s ravenous energy requirements. We can have fresh food from any country and any season in our supermarkets, every conceivable comfort and gadget in our lives, we’re able to travel faster than the sound of our voices and communicate faster than we can stop to think. Quite apart from how this is affecting our planet, it would seem that in the Western World, despite our affluent and convenient lifestyles, many people are more stressed, less happy, and working longer than previous generations. Late summer evening in the Arctic. A boil up by the sea. Some people are beginning to wonder if we might have missed something along the way? 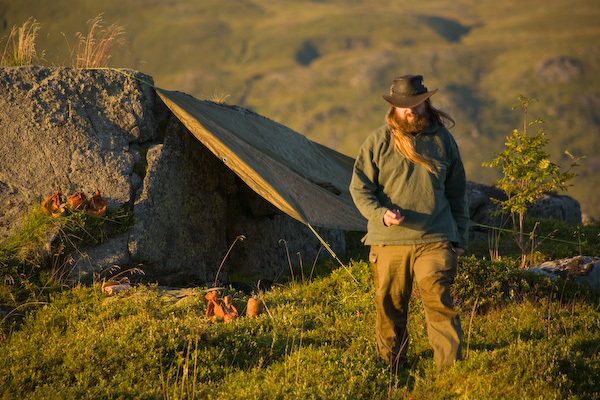 Gathering cloudberries around an overnight camp site on Lofoten. However else these developments have affected our lives, they have also now created opportunities beyond the wildest imaginations of our ancestors. We can travel to wild, wonderful and formerly inaccessible places. Using new equipment and materials, we can now survive under extreme and inhospitable conditions. All in the comfortable knowledge that if something unexpected happens, help is rarely more than a phone call away. For many, the new challenges that outdoor pursuits provide, have become almost a reaction to the pressures of modern living. Some tackle them with all the precision and refinements that modern technology can provide. Others prefer a simpler, more down to earth approach. 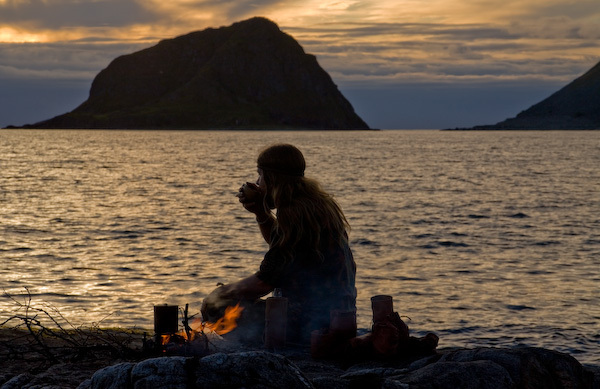 “Bushcraft” is a term that has become popular amongst such outdoorsmen (and women) to describe that simpler approach. A Quinzhee and campfire under the Northern Lights in the Boreal forest. Some people think of bushcraft as being the skills needed to survive in a hostile environment or an emergency. Certainly some of these skills could help you do that, but for most people that is a very unlikely reason to need such skills. The majority of people that now visit wilderness locations do so as part of a leisure pursuit. To my way of thinking, bushcraft is a way of travelling to those wild places and being comfortable outdoors without harming or impacting upon that very spirit of wilderness that inspires us all in the first place.